I’ve been going through a rough patch lately. I felt a call and answered it, putting myself out there, expecting rave reviews and open doors. But instead I was met only with silence. And waiting. And ultimately, self-doubt and defeat. It’s easy to glance over the fence and long for the yard next door, but for those of us who believe our paths are set and directed by an all-knowing, fiercely loving, infinitely wise, and GOOD God, we have to trust that when the answer to our heart’s desire is “no” or “wait,” He knows what he’s doing. A few years ago I picked up a copy of the small devotional, Jesus Calling, and began using it with my morning quiet time, where I read the Bible and pray before the hectic craze of my mommy day begins. A little ways through this book, I stumbled upon a short phrase that, as a prayer, has changed my life. This is important in acknowledging that God has the power to take care of both the really big, life-changing and the small, seemingly insignificant things in our lives. In His infinite wisdom, He also knows what is best for us. But not only is He strong enough to influence these things, and wise to know what we need most, He truly cares about them as well! 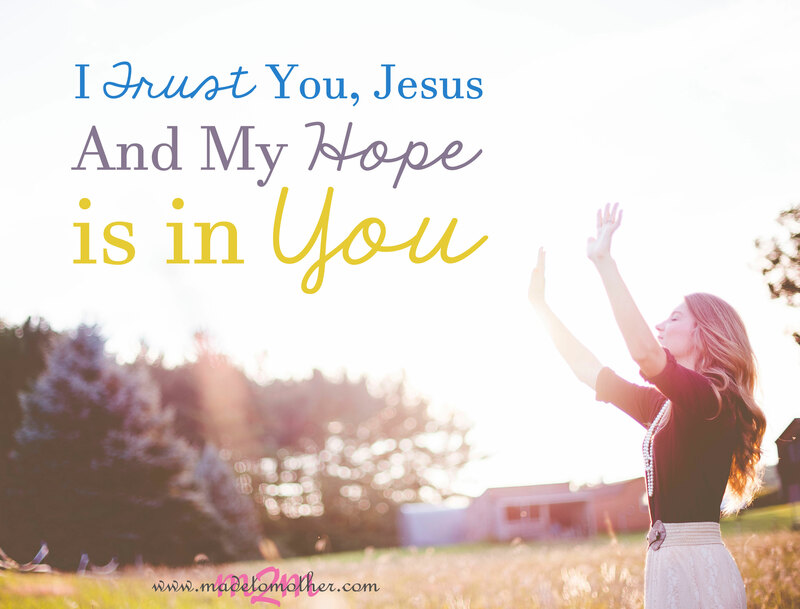 So, I say, I trust You, Jesus…with my kids, with my marriage, and with our futures. I trust You, not me, to provide for our income, for housing, and for food. And I trust the One who cares for me the most with my wants, my hopes, and my dreams. I repeated this phrase back to myself for a long time. Then, last year while having a conversation with my mother about a really scary time in our family, she gave me another short phrase that altered the way I looked at circumstances and the condition of my heart during prayer. It comes from Psalm 35:7. Not only do we trust God to work these things out for us, but we must also shift our hope away from ourselves, and the things we are asking for, and place it in Him. It’s so easy, even as Christians, to find ourselves placing our hope in things that can change, things that will fail us, or things that are insecure. But when we place our hope in an unchanging, infallible, and perfect God, we can rest in the knowledge that our hope will always be secure! My hope is in Jesus. Not in my kid’s behavior, not in my imperfect spouse, and not in our precarious future. My hope is in Jesus, not in my job, our home, or our possessions. And my hope is in the One who intimately knows my heart, my most secret wishes, but most importantly knows what’s best for me. I lumped these two nuggets of wisdom together, and now I have a new mantra that I use when I’m feeling scared, worried, or stressed over a million different things that adulthood, mama’ing, and just plain humanity brings. By God’s gentle grace, just breathing these words brings a peace and stillness to my heart as I lay each and every burden and desire down at the feet of Jesus, covering them in the amazing truth of this simple little prayer. By doing so, I conform my will to His, truly believing that He cares for even my smallest wants and worries, and will take care of them in His infinite wisdom and perfect timing. So, the next time something comes up in your life, and you feel anxious, worried, or scared about the outcome. Try praying this, and sincerely acknowledge that your trust and hope is in Him. Knowing that we have been heard, and that He can take it from here is the best feeling in the world! “I want you to learn a new habit. Try saying ‘I trust you, Jesus’ in response to whatever happens to you.